I've never really found a place in my physical life for a tickler file in my Getting Things Done workflow, they seem like a great idea but I have no real world paper to manage. When carrying out GTD training, I'm often asked if there is digital equivalent of a tickler file. I'm usually training fairly technical people who're trying to embrace the paperless lifestyle, the idea of having a draw dedicated to 43 folders and having to remember to check it isn't that appealing. Tickler files only work if you have the discipline to check them daily. There are various ways to fake a tickler file, some of which I use already. My current method is to put a link to the file I want "tickled" into [Omnifocus][omnifocus] with a start date of the day I want to see it. That works pretty well and certainly gives the desired (fully automatic) result. Well, this would be a pretty short post if that was the end of it..... But it's not. I was over in Houston doing training a couple of weeks ago and the topic of tickler files came up again. We discussed the idea of having a digital version of the tickler and some people though it would be really useful. I put a loop into Omnifocus's inbox and didn't think too much more about it. A few days later I was at the airport processing my inbox while waiting to board. I got to the inbox item "Digital tickler files?" and when I got to the standard GTD question of "is it actionable?" I decided, "yes, it is". 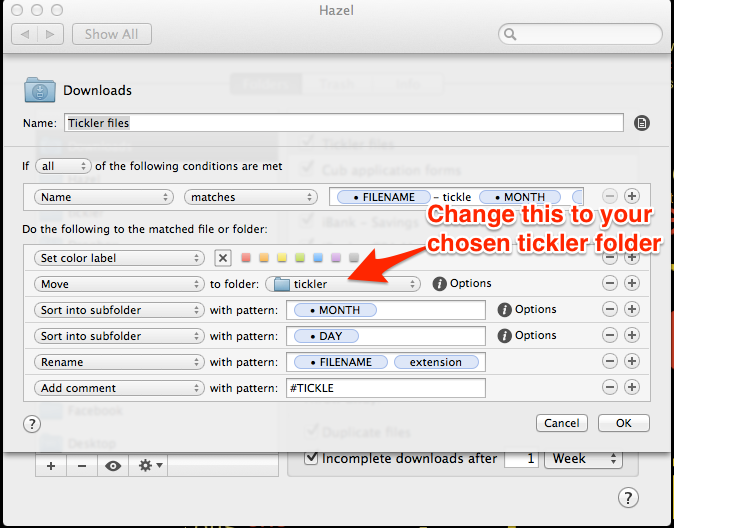 I spent the next couple of hours figuring out how to setup a fully automated tickler file system on a Mac using a wonderful tool called Hazel. For those of you who (for some unknown reason) don't know what Hazel is, I'll quote their website : "Hazel watches whatever folders you tell it to, automatically organizing your files according to the rules you create." I use Hazel extensively to manage my files, handle my filing, organise my backups and perform housekeeping on my directories, amongst many other things. I figured if there was a tool that could take care of the hard work involved in a digital tickler file, Hazel would be it. What I've come up with is a couple of rules that take your files and put them under a tickler directory structure, which Hazel manages. The rules also then "untickle" the files on the day that you've requested them back, moving the files back into a specified directory. Enough waffling, let's get into how you can set this up. Firstly, obviously, you need a Mac running the Hazel. At the time of writing this I'm running version 3.1.3 of Hazel, I'd recommend a recent version as one of the conditions (Current Time) was only recently added to the product. You need to decide two things, which directory will be your "inbox" and which directory will contain your "tickle" directory. I use my Downloads folder as an inbox and put the tickle directory on Dropbox under $user/Dropbox/Documents/tickle. You can obviously change these to suit your setup. You then need to download the rules and import them into Hazel. The rule "Downloads" needs to be associated with your chosen inbox folder, the rule "tickler" needs to be associated with your chosen tickle folder. Once those files are in place, you can start testing. Easiest initial test is to add a filename suffix to a file in your inbox. Hazel will look for anything that has a filename that ends in - tickle MMM DD (e.g. example - tickle Jan 01.txt). Hazel will strip out the - tickle MMM DD and put the file into your tickle folder in a structure like this tickle/MMM/DD. You can use textexpander to automate the addition of the suffix, there is a snippet in the download which will help you out. Once the file is in the tickle structure, you can safely forget about it. On the day you've chosen, the file will automagically be placed back into your chosen inbox folder, ready for you to work on it. I'm actively developing the code, but it seems pretty solid at the moment. You can download the code from my GITHub site. If you have any comments, suggesitons or problems, feel free to e-mail me.